I've been hyping up Rachel's 2nd birthday party when I talk to her about it. I assure her she is having a penguin party and shortly after seeing her penguin cake, she realized what was going on. 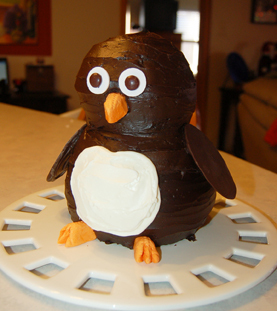 She would wake up from her nap and see the cake and say, "penguin party." 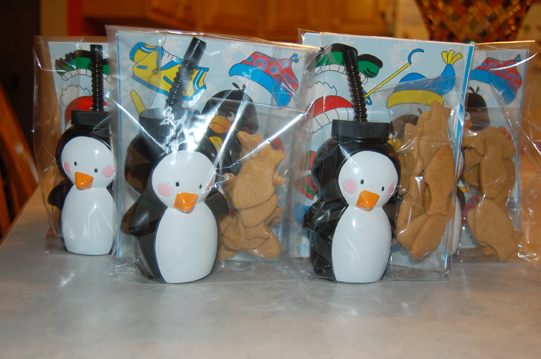 When she saw her penguin party favors she would say, "waddle, waddle, waddle, penguin party." 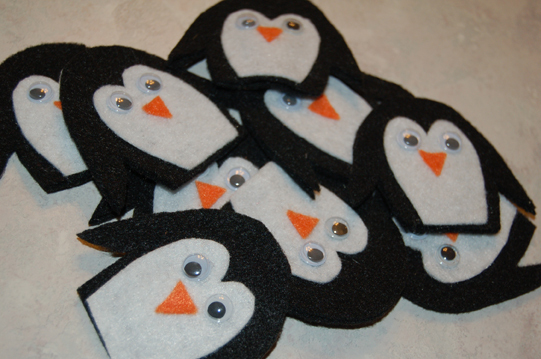 We've been wearing our penguin finger puppets and practicing our song so we shared it with our friends at school. She loves to sing it and so did the kids. It's so great being next door to her school! ...you put them all in a gift bag for friends! 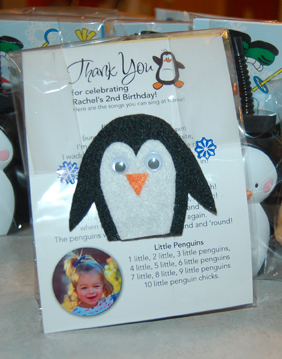 And the penguin finger puppet is attached to the back of each bag with a piece of velcro so we could take off the puppet, sing our songs and put it on for each kid to take home. 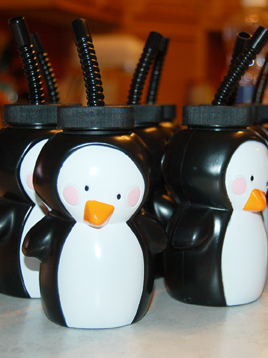 A penguin party isn't complete without a penguin cake! This was SUPER EASY to make and I found the recipe here. I followed the directions except, I used Duncan Hines Dark Chocolate Fudge Frosting, which means I didn't tint the frosting with black food coloring as the recipe stated. I also made the wings out of chocolate. I just melted chocolate chips in a zipper bag, cut the end and traced an oval pattern on waxed paper. 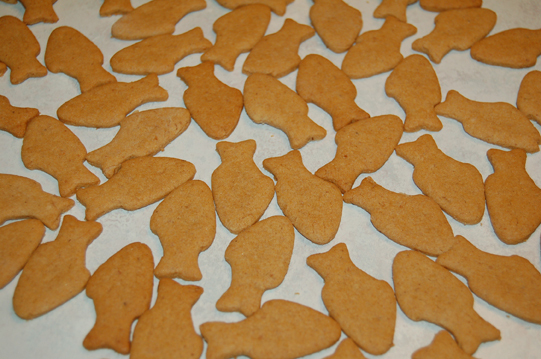 Once they were dry, I affixed them with frosting, flat side down. 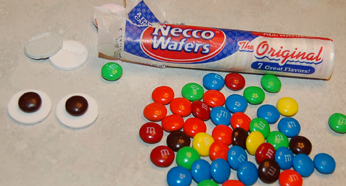 I used necco wafters and m&ms for the eyes. 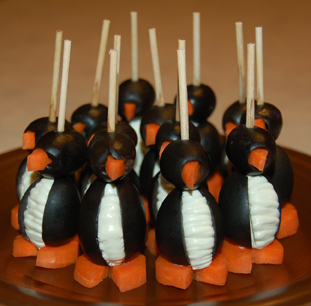 I made these super easy penguin olives and a cheese ball igloo for snack. 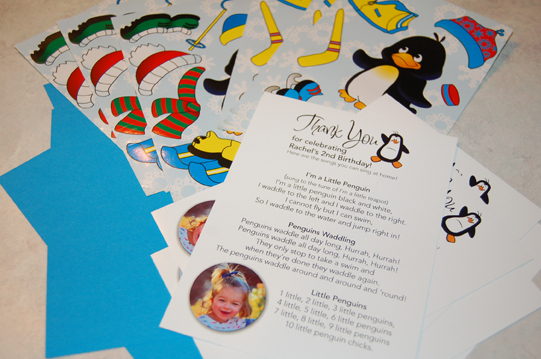 I thought the Penguins were going to be very hard to make so I told myself from the beginning I would only make 12 - for the number of kids in her class. I used jumbo and medium olives, one carrot and half a brick of cream cheese, heated in the microwave. I then cut a triangle out of the jumbo olives and used a pastry bag with tip to fill the bellies with cream cheese. The cheese ball recipe was very basic: 2 bricks cream cheese, 1 packet ranch and 2 cups shredded cheese. It's quite mild, so it might be perfect for toddlers. I put it in a bowl with plastic wrap and then let it set up/harden. 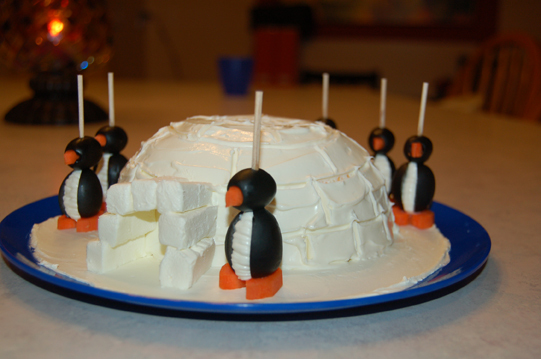 I heated the other half of the cream cheese brick in the microwave and spread it on the igloo, then let it set up and used a skewer to make ice blocks on the igloo. 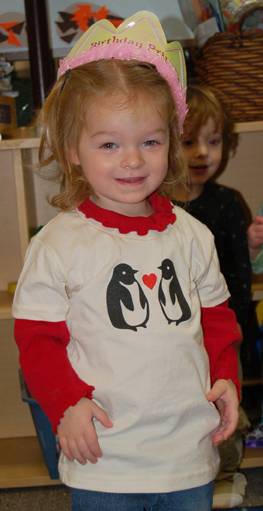 And of course my daughter wore her penguin tee shirt on her special day! Two penguins for a 2 year old!